Procrastination can not only plunder and steal your time, as the old saying goes. It can also commit grand larceny upon your wallet. As the data below shows, delaying investing for the future makes the task exponentially more stressful and difficult when you eventually do begin. 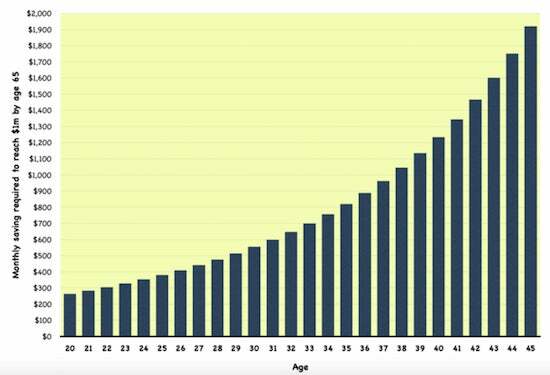 Indeed, in the example shown, the numbers demonstrate that by putting off saving for retirement by just five years from age 25 to 30 requires the amount to be saved each month to be over 45% higher at age 30 than age 25 to reach an exactly identical goal by age 65. And when you look at such a comparison at older ages, these numbers can become downright terrifying. To clarify, if today is your 20th birthday and you begin a system of saving $263.67 every single month—that's $3,164.04 per year—for 45 years, never pay any taxes or investment fees on it and earn 7% a year, you will have $1 million in the bank when you hit age 65. 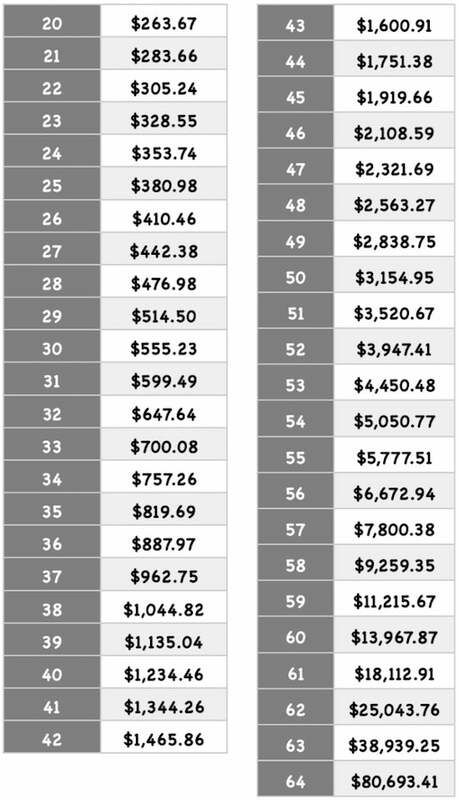 If you start the process under the same conditions on your 30th birthday, you now need to save $555.23 every month ($6,662.76 per year) to reach that same goal. That rises to $1,234.46 every month ($14,813.52 per year) starting at age 40 and a monthly hit of $3,154.95 ($37,859.40 per year) at age 50. There is nothing magical about the $1 million figure, of course, and this is very much not an assessment of whether that particular amount available at age 65 is appropriate. That's an entirely different discussion and it is not the purpose of this piece to advise you that you need to save these exact amounts because you need to reach that exact target. 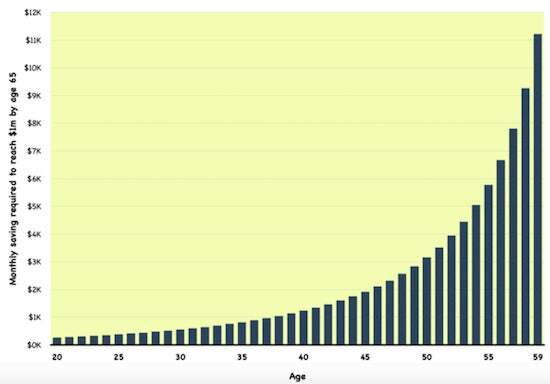 I have zoomed in on the 20-45 age range below to show an even more graphic picture of why people of those ages towards the left hand side of the chart can make life so much easier for themselves by finding a way to begin investing now. Not next year. Not in three years time. Now. I am certainly not discounting the real-world consideration that, for many people just starting out in the workforce, it can be hard at a young age to come up with even the few hundred bucks needed to make these monthly contributions. Remember, though, that there can be ways to have someone else contribute a portion of these amounts. For example, contributing immediately to a 401(k) plan with an employer match if it's available or opening other tax-advantaged accounts like IRAs where the government will effectively kick some in, too. Dutifully investing a portion of any gifts, inheritances, tax refunds, pay raises or bonuses can also help do the trick without necessarily cramping your lifestyle. Consider the above chart to be also representative of a stress-index for people who know at their core that they need to save for the future, but the longer they wait to start, the more impossible the task appears and actually becomes. Look at the difference how much the guy who starts doing this in his early forties (an age at which many people do indeed turn their attention to this matter for the first time) needs to put away, versus someone in their early twenties. It's perhaps no wonder that so many people of this age or older sometimes throw in the towel when they do the math, say that they just can't manage it and simply abandon the project, thereby possibly condemning themselves to a future living in poverty or being financially dependent upon others. Also, remember that when the required amounts really take off if you don't start until your thirties and forties, it can often coincide with a time of dramatic increases in other competing life expenses such as bringing up children, saving for college, mortgage payments, property taxes, insurance premiums etc.—factors that are often absent or at least more limited at younger ages. Oh, and there's inflation to think about. For more you can listen to ANGLES: THE PODCAST Episode 2: "Procrastination Is the Thief of Wealth" (November 5, 2016), a companion podcast to this post on Investopedia, discussing compelling data that demonstrates the critical importance of saving and investing starting at an early age. (17m 26s) This content is from the Anglia Advisors blog and is subject to all disclaimers and disclosures found elsewhere on the website. Anglia Advisors is a New York Registered Investment Advisor.